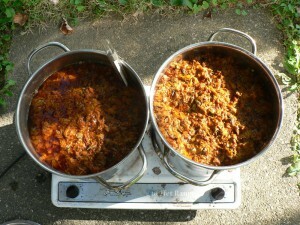 In total, over the course of about 2 weeks, I dyed over 3lb. of wool. Yes, at one point the dyebath did get moldy while it sat idle for a few days when I was scouring and mordanting more yarn. Additional ammonia and some stirring did the trick. 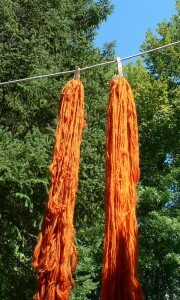 Here are the first two skeins as they were drying. 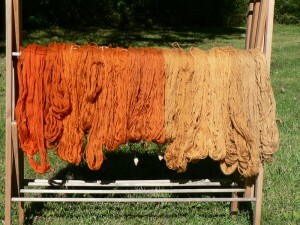 And here are all of the skeins now that they are rinsed and dried. There were 8 baths in total. I got a lovely wide range of color, as you can see. It is interesting to me that there is such a big difference in color between the 4th and 5th exhaust, and I’m not sure why that happened. It would have been nice if the shift were a bit more gradual. However, I plan to use these in a rya rug, so I can do additional color blending as I tie the knots. 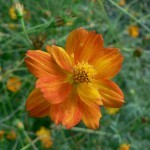 Orange cosmos are gorgeous. 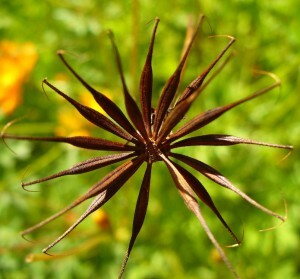 Even the seeds are beautiful. 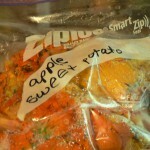 I’ve been saving my own seeds for many years now, and they are easy to save. 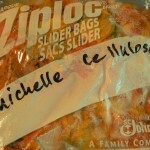 I started growing them in 2001 with “Cosmic Orange” and “Cosmic Yellow” seed from Johnny’s. In 2002 I used saved seed from Johnny’s plus new seed from Seeds of Change (“Bright Lights”). I guess what I have now is some combination of these. The plants tend to be tall (4-5 feet) and produce a variety of colors including yellow, orange, and red-orange stripes. 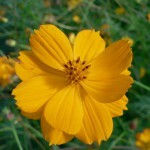 They are easy to grow from seed, are tolerant of neglect, and don’t seem to need any special soil conditions. 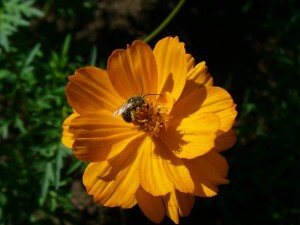 And they are great for attracting pollinators to your garden.